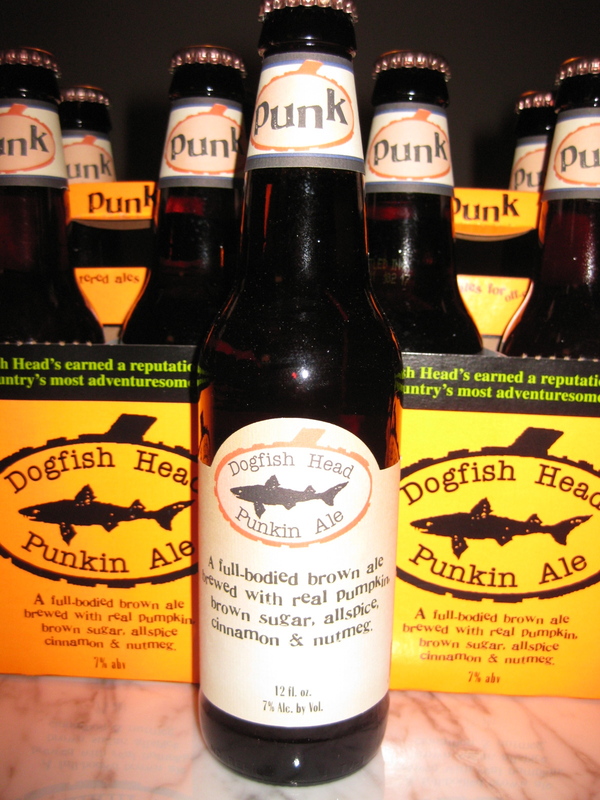 'Tis the season of pumpkins and especially Punkin Ale! 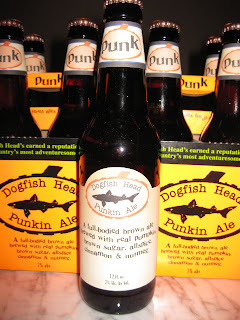 Dogfish Head's Punkin Ale is a seasonal ale which has a smooth, easy-drinking, honey-brown flavor and isn't hoppy. There is a very subtle pumpkin flavor and hints of spice (their label says it contains allspice, cinnamon and nutmeg... yum!). I'm even enjoying one right now for inspiration as I write this! Unfortunately, the cat's out of the bag and it's in high demand in pumpkin season, leaving it medal-worthy if you snag some for your own stash. The hubby and I were calling around trying to see if any place had some in stock. Our hopes were squashed as we kept getting the same answer "Sorry, sold out for the season". We were about to give up until hubby magically found out it's sold on Fresh Direct! Sure enough we were able to snag 3 4-packs. Happy happy joy joy! 12 Punkin Ales! "A full-bodied brown ale brewed with real pumpkin, brown sugar, allspice, cinnamon & nutmeg" - Delicious! Make sure to check out this brew if you haven't already. Side note: pairs well with roasted pumpkin seeds! Since we're on the topic of beer, I figured I'd share another ale I recently enjoyed. 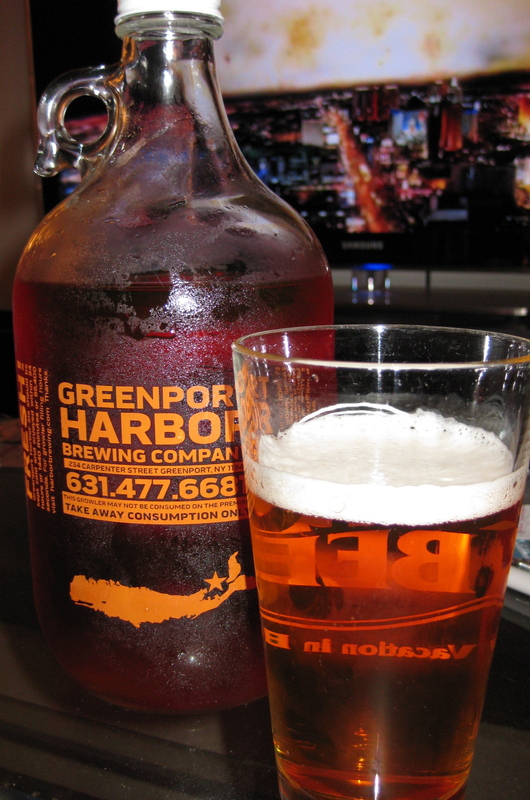 Greenpoint Brewery is located right in Long Island in (you guessed it) Greenpoint! 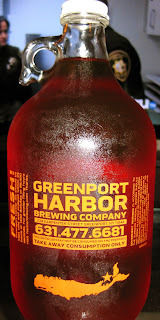 Mom and Dad were out there exploring the town and lucky for me, picked up a jug of their most popular brew - Harbor Ale. Their website describes it as an "American Pale Ale with a twist. Brewed with 50% wheat malt to provide a smooth and subtly sweet base to showcase the Amarillo hop and all its orangey citrus glory." It was a light beer and easy-drinking. If you're in the area, check them out! 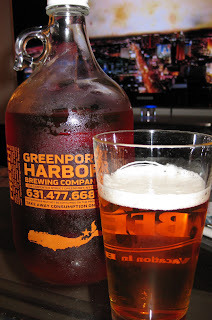 A JUG of Harbor Ale! Now are you in the mood for beer? I hope so, because it's Friday - go get your weekend started! Piggy says yes for both beers! Too bad it's seasonal, it is pretty good stuff.